Perttu Haapanen is a Modernist, but his idiom is like a refreshing typhoon within that style. “Like a true Modernist, he has sought and explored the bounds of his idiom in diverse ways, even though his works are always carefully considered and polished,” writes Kimmo Korhonen. His output is diverse, and many of his works are tinged with an original sense of humour in their sounds and for instance in the invented languages of his vocal works. 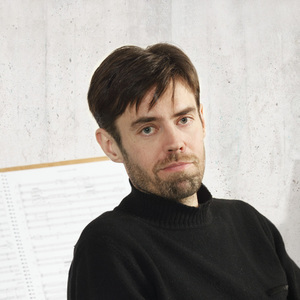 Indeed, the language aspect is of particular interest in Haapanen’s music – “whereas the solo sax piece Aria nearly crosses the boundary to language, [the chamber opera] Solity:d almost abandons the meaning of text,” the composer writes.